Winner Casino caught my attention right from the start with its dark and simple theme without being overly flashy. I don’t like casinos that display their bonus offers or games in bright and flashy design. Just by navigating the site I could learn a lot of information about it. Winner Casino was established in 2009 and is operated by Zirconium Gaming Limited. It is licensed and registered in Antigua and Barbuda. I could also see the seal of approval from TST which means the games are fair and random. The casino also stands up for responsible gambling and redirects problem gamblers to useful help sites. I also noticed that the casino uses Playtech software to power its games and that besides virtual casino games it also offer live dealer and mobile casino play. Moreover, there was the option to play Vegas games, poker, bet on sports and live betting. I was intrigued to find out more so I registered a new player account. As a blackjack player and huge fan of the game, the first thing I visited after completing the registration process were the blackjack games. I’m familiar with Playtech software so I knew that I would find high quality games with crisp and clear graphics and sound. They also loaded pretty fast and run without interruptions. Moreover, most of them were available in both free and real money mode. The following were some of the blackjack variants I came across: Single-hand Blackjack, Multi-hand Blackjack, Perfect Blackjack, Blackjack UK, Live Blackjack, Single and Multi-hand Blackjack Surrender, Blackjack Switch, Live Unlimited Blackjack and Pontoon. I could also see that the casino had recently added some new blackjack games which were pretty exciting. These were Double Attack Blackjack, Blackjack Super 21 and American Blackjack. Of course, my personal favorite blackjack game from Playtech is Progressive Blackjack and so I made a quick deposit and played a couple of hands, and i wasn’t disappointed with how the software handles. I also jumped onto a couple of the Live Dealer blackjack tables. There’s 11 in total to choose from with limits from £1-£500, and it’s just really a preference of which dealer you want to play with, as the rooms are all pretty similar. Winner Casino also offers other high quality games from Playtech like various types of slots, card games, roulette, live games, video poker, arcade and jackpot games. My second favorites next to blackjack are the Marvel Series slots and I was very happy to see that I could play X-men, Wolverine, Iron Man and other slots. Gold Rally and Mega Jacks are my two favorite progressive jackpot games so I also decided to give them a try. Marvel Roulette was also impressive. In future I will also check out some of the video poker games like Joker Poker, All American and Aces and Faces. It was quite interesting to see that Winner Casino offers 5 types of welcome bonuses I could claim to play blackjack and other casino games. Moreover, they are suitable for different types of players or low, mid and high rollers. The bonuses aren’t really laid out very well on the website though, and it chops and changes for currencies. It was much more straight forward when they had just the 3 deposit offers, but here’s a brief outline of the 5 offers available. Level 1: Deposit £20-24 and get 25%. Level 3: Deposit £35-499 and get 200% up to £300. Level 4: Deposit £500-1,999 and get £500. Level 5: Deposit £2,000 or more and get £1,000. I have pretty tight budget so I decided to go for the 200% welcome match bonus up to £350 given on my first deposit. The bonus plus deposit have to be wagered at least 22 times before requesting a withdrawal. The higher Welcome Bonus offers require playthrough requirements of 20 times and 15 times respectively. All welcome bonuses can be used to play blackjack and all blackjack variants, excluding Blackjack Switch and Pontoon, contribute 20% toward the wagering requirements. So far so good! In addition to the €1,250 Welcome Bonus, Winner Casino also gives a 25% bonus on your next four deposits during the first month. The casino also offers alternative payment method extra bonus of 10% and 15% if you decide to make a deposit via Neteller, Internet Banking, PaysafeCard and InstaDebit as well as through Skrill, UKash and iDeal respectively. Furthermore, I decided to invite a friend and I got £50 when he joined, made a deposit and played through the requirements. My friend also got £25 on top of his welcome bonus which is pretty good. I also noticed that Winner Casino has six-tier VIP program where VIPs get bigger monthly match deposit bonuses, tickets to exclusive events, their own personal account manager, more special cash promotions and prizes and other thrilling red carpet luxuries. Last but not least, regular players also earn comp points that can be redeemed for real money. The more points they earn the higher VIP status they get. Winner Casino is also mobile compatible and can be accessed on iPhones, iPads and Android powered mobile devices. There are two ways to get access to Winner Casino Mobile- scan the provided QR code or send SMS activation link to your device. 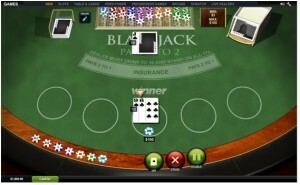 I had to see how blackjack works on my iPad and I have to point out that the graphics of the game were stunning. Everything was clearly displayed and the games run smoothly. At the bottom of the homepage I was able to see the banking options available at Winner Casino. These were credit and debit cards like Visa, MasterCard, Maestro and Visa Electron as well as other methods like Neteller, Skrill, UKash, iDeal, PaysafeCard, InstaDebit, Internet Banking and a couple of more. Some even came with extra bonus if you choose them as a preferred deposit method. 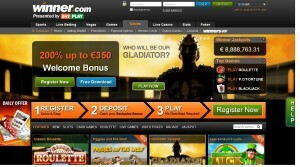 The minimum deposit and withdrawal limit at Winner Casino is €5 which is quite favorable. I also saw that deposits are immediately processed and don’t come with fees. Withdrawals, on the other hand, have pending period of 3 days, while the average processing time is one day for e-wallets and up to 7 days for credit and debit cards. Some withdrawal methods may come with small fees. 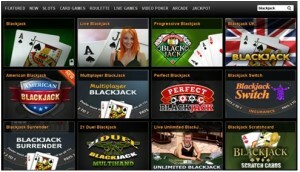 To sum up, Winner Casino offers a great deal of casino games, good selection of blackjack games, high quality software, has well-tailored bonus program suitable for all players, the banking options are safe and recognizable, the security is top notch and players can easily reach the customer support. I also noticed that the casino has international character- it is available in 18 different languages and accepts various currencies which is a big plus.